In general, I love pc and console games. I can't recall a time in my life where I wasn't fixated on one game or another. My earliest recollections are Centipede and Donkey Kong on the big arcade machines that were at my corner store while I was growing up. My experiences with those inspired me to beg my parents for an NES until their ears bled. I won, as I expected. Never underestimate the combination of obsession and patience in children. I was not the owner of a computer then, I didn't even really have access to one outside of school (however, I did have some brief but fabulous experiences with Infocom gam es on the Apple II at school). So my first real graphical adventure experience was on the NES. It was a game called Deja Vu. 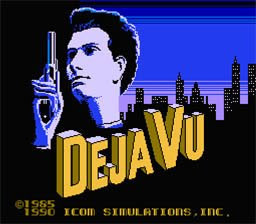 In Deja Vu, you awaken from being drugged in a bathroom stall, and must solve a mystery set in a hard-boiled, noir-style environment. I couldn't believe they put this in a game. It affected me in ways I couldn't really describe to the people around me. It was like a book, but I could affect the outcome of the plot! And despite my lack of being able to entirely solve the mystery (that game had to be broken), Deja Vu lit my fire for adventure games. I didn't know that they were part of an established genre at the time. Perhaps that was for the best. Then came Maniac Mansion. It had been released for quite some time before I got to play it, which was in the very early 90's. I was playing on an old Tandy 1000 at my then-boyfriend's house. I was so excited to find another story based game to immerse myself in. I skipped a few days of school, just to go over there and play it. This event opened my eyes to the amount of these games available to the realm of computer gaming. This is when my desire really took root. 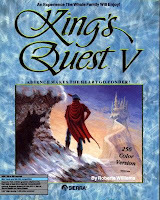 So began the many years of lusting after the King's Quest boxes (Especially KQ 5, which had the most heavenly blue packaging). After a significant time pining away, I finally saved up enoug h money to get my first computer. My life changed forever. I went out and bought as many of these games as they had on the shelves. This was the mid-90's so what I was able to buy was mostly FMV cheesiness and the games from the studios of Lucas-Arts and Sierra On-Line. I was in love. I called in sick to work. I refused to leave my apartment. All I wanted to do was lose myself in these delightful stories. Sometimes they were so cheesy I felt a little guilty. I loved them all the more. Someone had to. I know I wasn't alone there, too. I started haunting websites catering to the adventure gaming audience. For a little while, I contributed articles to Adventure Gamers. AG was and still is one of the most authoritative sources for adventure game news and related writing. I loved that. But then life got busy, and I had not quite the same time to indulge in my (relatively introverted) hobby. I hung up my writer hat and put my collection of games in storage. But now, I find myself with a special opportunity. I have more time for my hobby, and there are a lot of fantastic-looking games coming out, or released in recent years. I am also feeling the burning urge to play through a lot of the classics in my collection. So it is time for me to begin this blog. I'm going to indulge in one of my most delicious obsessions, and I'm taking my trusty blog with me as I delve deep into the current trove of adventure games. How good (or bad) are the new games? Do the old games hold up? Was FMV really the stinker everyone thought it was? I intend to find out.